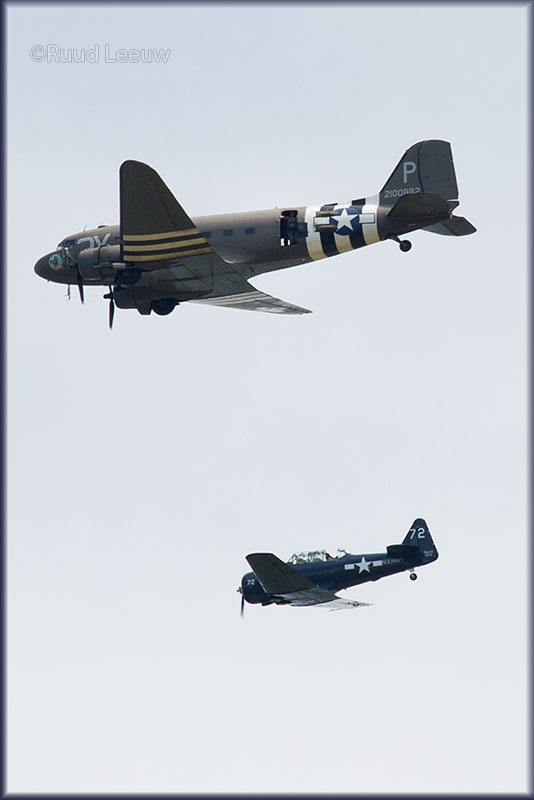 The decision to join the crowds in celebrating the 70th anniversary of the 6.6.1944 D-Day invasion at Normandy was an easy one, as it would also bring a mouth-watering gathering of Douglas C-47's and DC-3's to the area. Although published as an air show at Cherbourg - Maupertus Airport, for 04 + 05 + 06 June 2014, this was found to be a hoax, a fiasco, as there was no program, no information and most of all no access beyond the fence. So no visits to the aircraft. It was very strange that no trouble was undertaken to explain the air show cancellation on posters at the terminal. The crowds gathered for the air show was obviously of minimal consideration of the organisers. Besides Cherbourg air show we also visited several other locations, I hope you will enjoy the report below. The Normandy Tank Museum at Carentan. On the outskirts of the village of Catz, and within the commune of Carentan, the Normandy Tank Museum utilises part of the original site of the old A10 Airfield. Built by 826 Engineer Aviation Battalion, the airfield construction started, under enemy fire, on 15th June 1944 and by 19th June 1944 received the first P-47 Thunderbolts of 50 Fighter Group. The airfield was built at the crossroads of the old N13 Paris/Cherbourg and the N174 St Lo/Cherbourg roads in the hamlet of 'La Fourchette'. The runway was 1500m long by 35m wide and laid out on an east/west axis (81°). The museum was opened as recent as June 2013 and is a pleasure to visit with lots of interesting displays. We spent some time at 'Camp Arizona', a gathering of WW2 re-enactors with some great equipment on display. this display and couldn't resist! 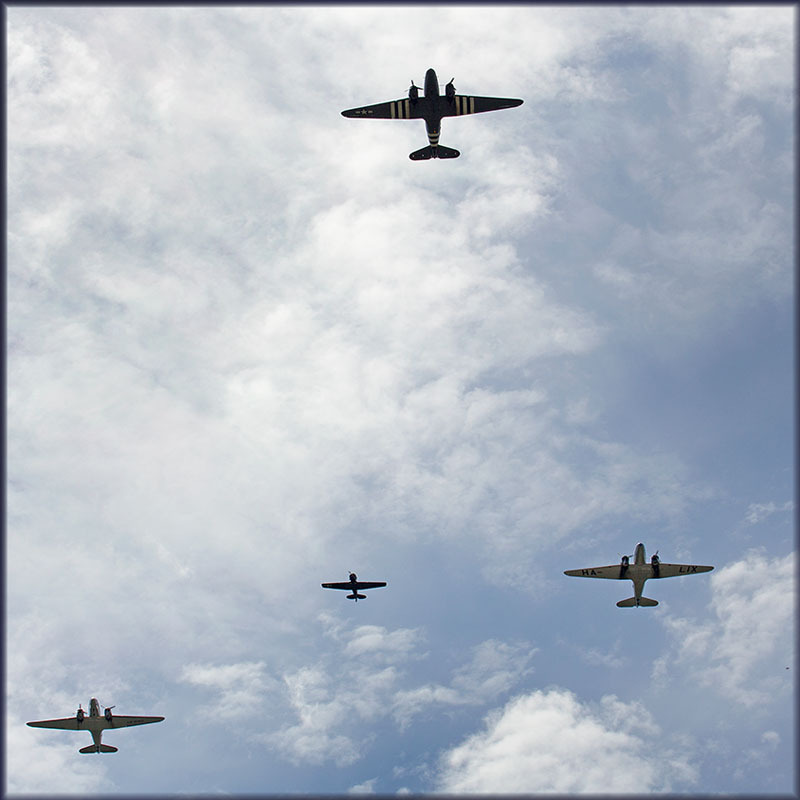 from that WW2 era, also in search for the drop zone as an ideal backdrop to filming an American patrol. Finally I was informed, by a friend, that the para drop was cancelled due to high winds. to renting a static at a campground near Granville, a 1hr45 drive to Cherbourg. 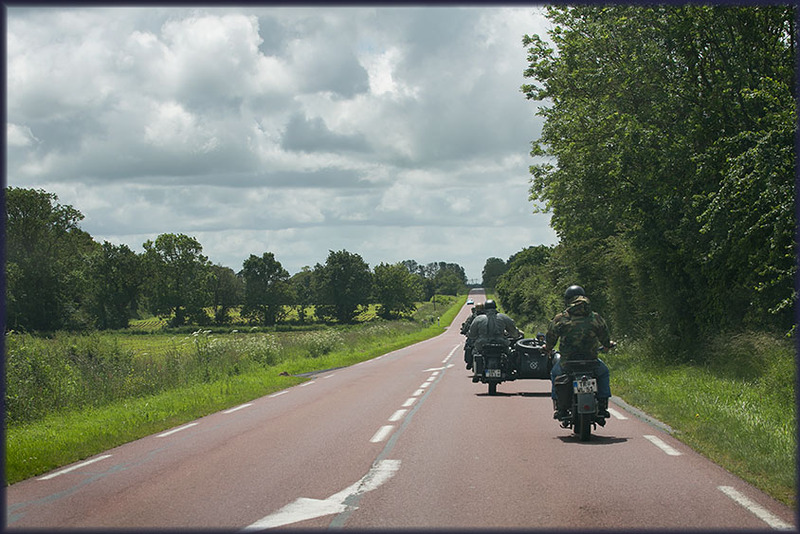 We shared the roads with many vintage WW2 vehicles. Access to the aircraft, anything beyond the fence, was not allowed. So much for an air show. For more information on the aircraft, e.g. 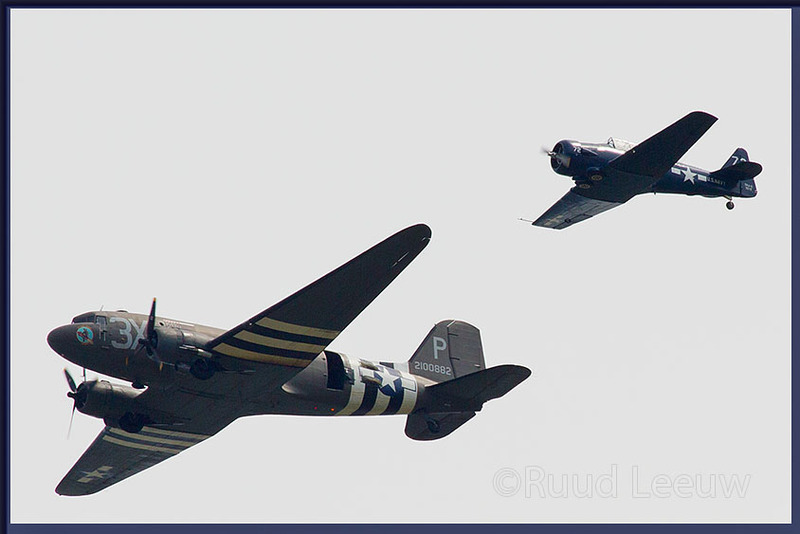 history details of the airframes, see my 'propliner'-page on this event. While not in WW2 colours, this Douglas DC-3 (US military designation C-47) is in fact a WW2 veteran. These guys got a good spot! These guys came well prepared, bringing step ladders. And a picnic lunch! Briefing and preparations for the round canopy parachuring team in front of the terminal. An unusual crowd gather in the terminal, ready for boarding. The Breitling-sponsored DC-3 in a graceful departure. 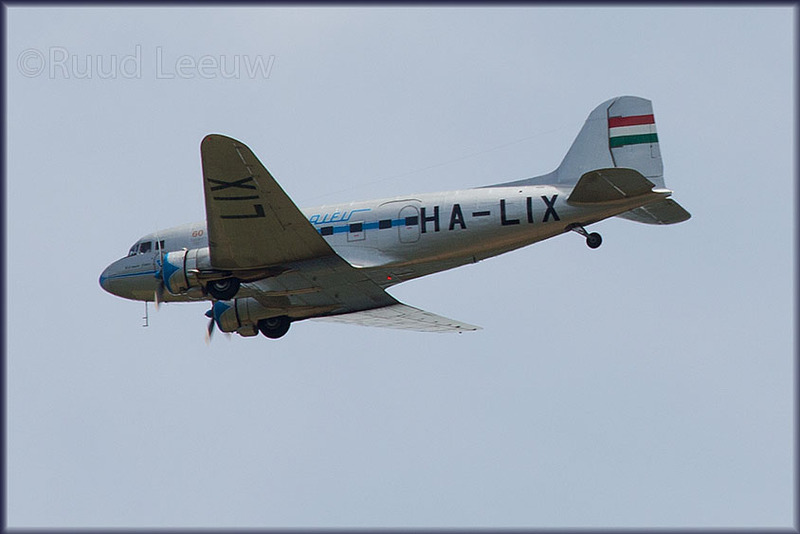 This one looks like a DC-3 but is in fact a Russian-built Lisinov Li-2. This Douglas C-47 had as task in WW2 to pick up the Waco gliders and bring it back to England. Details of such a task further below in the part on my visit to the Airborne Museum. This DC-3 / C-47 has its nickname painted on the other side: 'Drag-'em-Oot'. We discovered this Waco CG-4 glider, a replica no doubt, in a field when we tried to avoid the traffic jam on the E46 to Sainte-Mère-Église. For details on the Waco CG-4 glider see WIKIPEDIA. I think it was in a field in Saint-Côme-du-Mont, as I recall passing 'Dead Man's Corner Museum'. Unable to find a parking spot in Sainte-Mère-Église, I drove on and sat in a field from where I took this photo. Curious cows approached, including a bull, so I thought it wise to park in another field, as close as I could get to Sainte-Mère-Église and do the 45 minutes walk to the center to watch the drops by the parachuting team. These guys have the best seats in the house! This photo was taken upon take off at Cherbourg airport. Inside the church was this beautiful stained glass window. 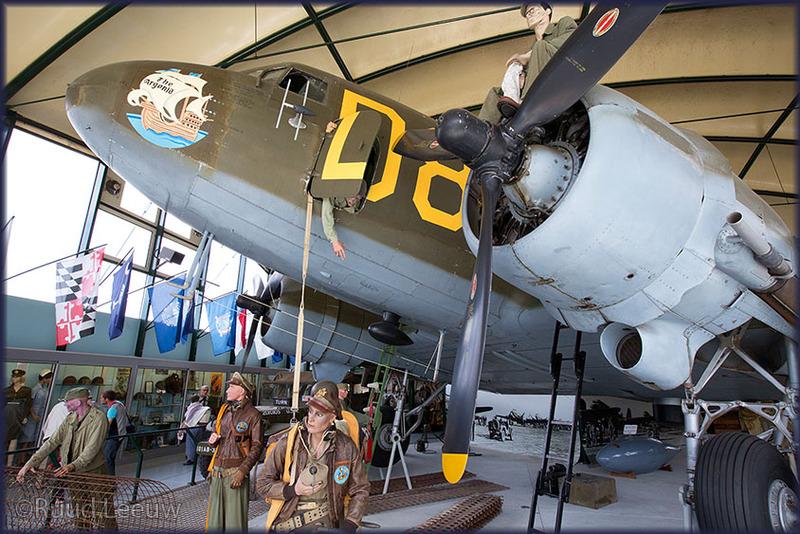 While visiting Sainte-Mère-Église one should not miss the Airborne Museum in the center of town. 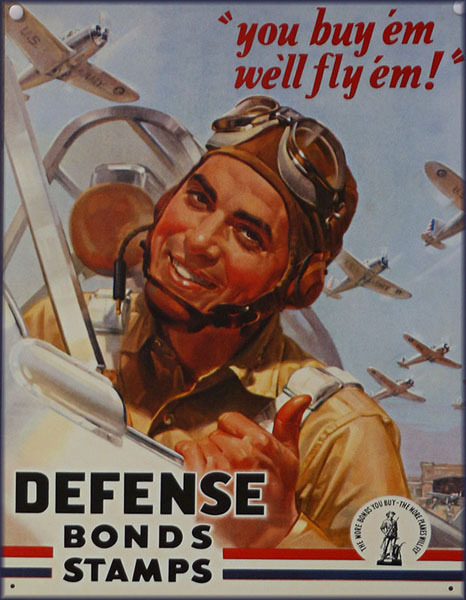 For me it held the promise of two Douglas C-47 airframes. This Waco CG-4 glider was indeed a bonus. 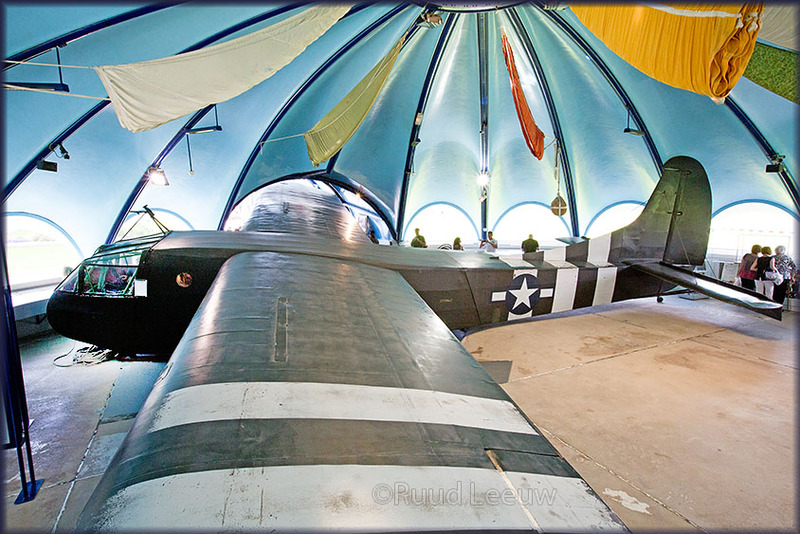 The Airborne Museum was established in 1964, in the heart of the village of Sainte-Mère-Église, Normandy (La Manche, France). Douglas C-47A 'Skytrain' 43-15159 / D8-Z (c/n 19288) This is former 42-100825, on display in the Airborne Museum as 43-15159. This C-47 had its last flight on 28 March 1982. 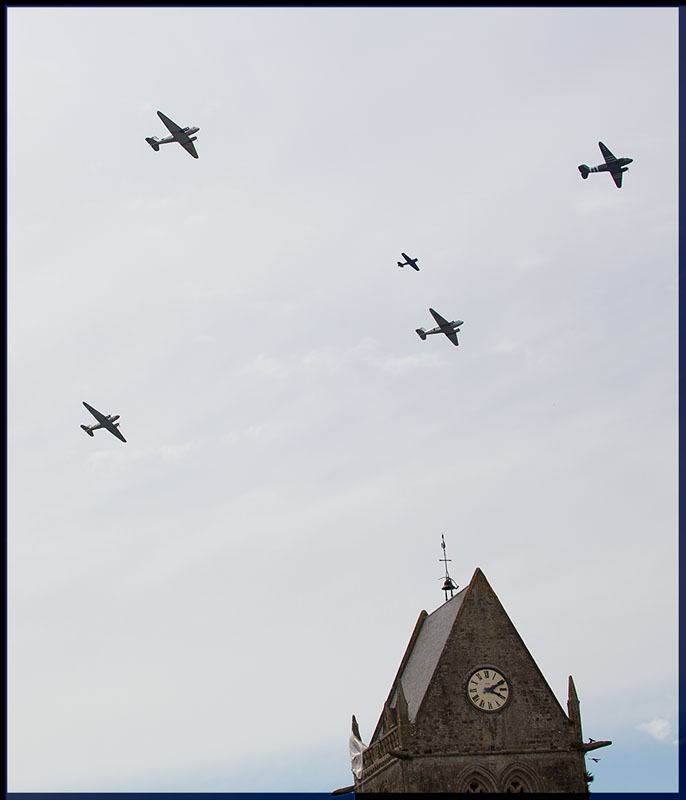 It was then presented to the museum on the 40th anniversary of the D-Day landings. Some more history details on c/n 19288 from my files: USAAF 42-100825 was surplus after WW2 and registered OY-DDA on 08mar46 for The Danish Air Line (DDL -which later became part os SAS-, this DC-3 was named 'Sven Viking'). 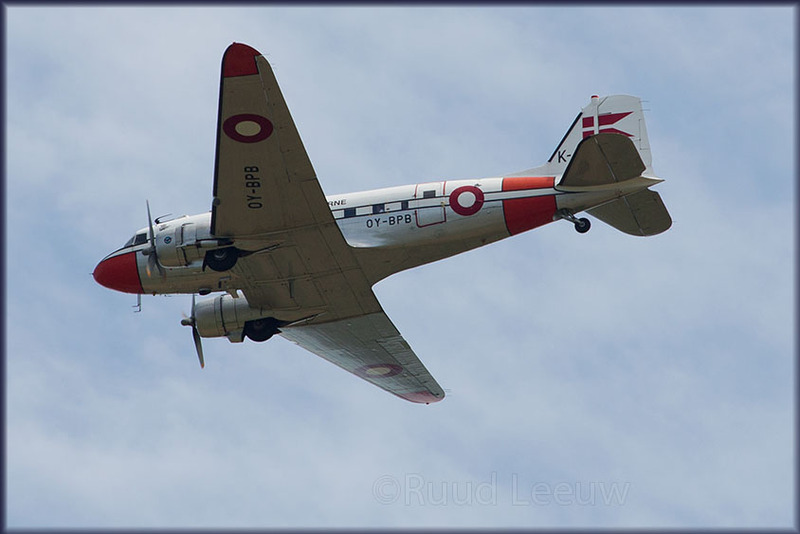 Its registration in Denmark was cancelled on 22Nov51 and subsequently registered as N9984F. It was at some date (1962, see below) picked up by the French Naval Department (it probably did not leave Europe for the US) and restoration was started by one Yves Tariel, President of the Parachutists' League of Friends who changed the livery of this C-47, decorated it with serial 43-15159 and named it 'Argonia'. "Sold as surplus after the war he became a civilian DC-3 of public transport in Europe and the United States. Bought by France in 1962 it again became a C-47, to equip the S-56 Squadron of the Naval Aviation based in Nimes (France), where it served as trainer aircraft to train non-pilot aircrew in the Navy National. Reformed [sic] in 1981, Mr Yves Tariel obtained the assignment with the Ministry of Defence to be preserved at the Airborne Museum of Sainte Mere Eglise." prepared as a walk through exhibit in the local area? c/n is 15813/32561." Alexandre Avrane supported this identity: "Yes, N4332E. Trucked 27-30oct06 from Le Touquet to St-Mère-l'Eglise." N4332E, ex G-BVRB, ex F-GDXP. Stored at Caen, moved by road Oct2006 to Le Touqet-Paris-Plage (LTQ/LFAT), about 80kms south of Calais. Remark of her condition in 2003: "N4332E, nose and engine detail of this old lady. Apart from the ragged rudder, she seems to be in remarkably good condition." C/n 15813 constructed as a C-47B-25-DK by Douglas at Oklahoma City,OK,USA. Circa 1944 delivered to United States Army Air Force (USAAF) with serial 44-76229. New construction number, 32561, assigned to the airframe due to duplication of batch series. Transferred to the Military Aircraft Storage and Disposal Center (MASDC) with inventory number KN307. Taken on Strength/Charge with the United States Navy with BuNo 476229. To unknown owner with c/r F-RAMP, same as F-RAXP, same as F-RAOD,, same as F-TEFJ, same as F-GDXP. During 26July1994 - 27July1994 to Aces High Ltd, with registration G-BVRB. On 27 July 1994: to Aces High Ltd, North Weald, Epping. On 9 May 1995: Civil registration, G-BVRB, cancelled. To unknown owner with c/r F-GNFD. To Euroworld Miami Inc, Miami, FL with c/r N4332E (DC3C, 32561). On 4 June 1999: Civil registration, N4332E, cancelled. Exported to France, in derelict condition. ex/F-GDXP, entered UK-register 27jul94 Aces High Ltd as G-BVRB after 10 months storage at Shoreham; new engine refitted and ferried to France; rereg F-GNFD. At Dinard Sep96 F-GNFD. Reg'd N4332E for Euroworld Miami Inc 200598. Reported at Le Touqet 28mar99 (N4332E). Again 03Apr03 same, and again 14May03 with added details: colouscheme silver/white & rudder damage, in fairly poor condition. Acquired a slide as N4332E ('E') taken Easter @Le Touquet 2002. Registration canx May99; wing section trucked 27Oct06, rest soon, to Ste-Mère-l'Eglise for WW2 exhibit. My page Photos by Friends & Gustest (40) has photos by Gerben Groothuis of this fuselage in 2013. This part of the museum is a new addition and only opened earlier this year. 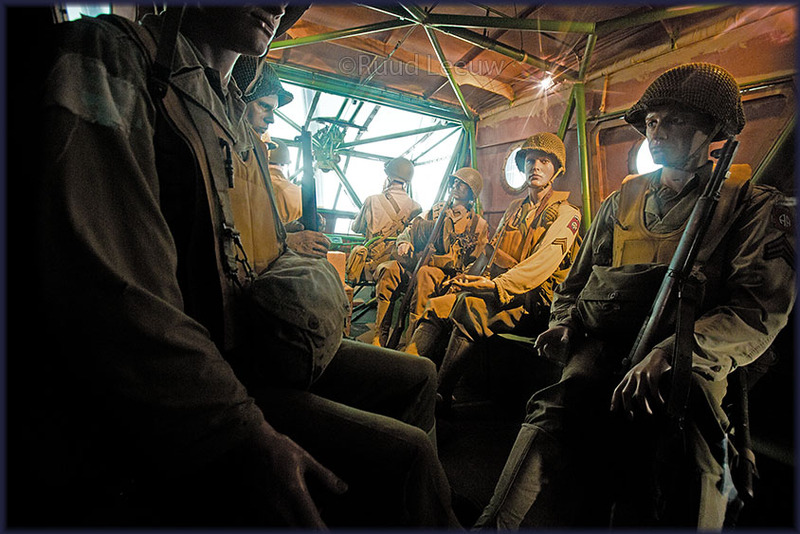 This tour brings to life, through different sequences in chronological order, the experiences of the individual paratroopers of the 82nd and 101st Airborne Divisions, from boarding in England during the night of June 5/6th 1944, through to the battle of the Normandy hedgerows and the other operations in which they took part. 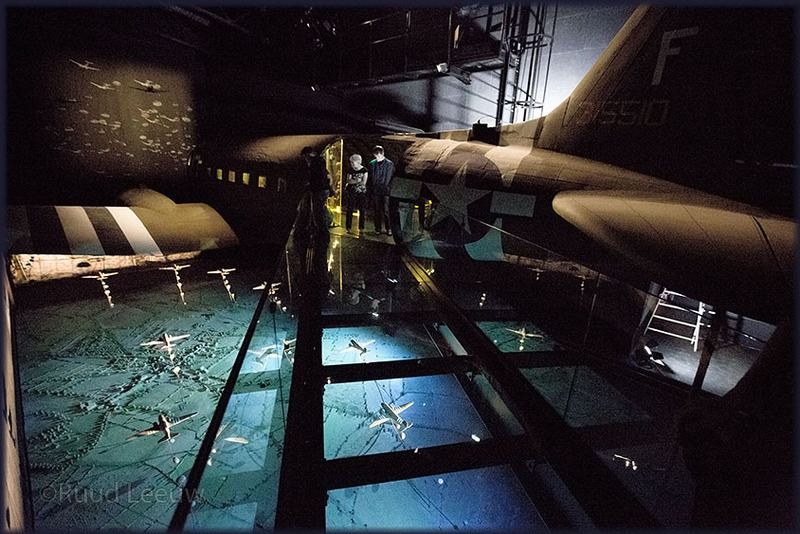 The public then board the aircraft, visit the flight deck and the paratroopers sat along one side of the cabin, ready for their jump over Normandy. The noise is almost deafening. Anti-aircraft fire and the plane’s engines make the fuselage shake beneath the visitors’ feet! The only source of light in the darkness comes from the cockpit instruments and the red and green flashing lights of the jump master who is standing near the jump door. Just like the paratroopers, the visitor steps out of the aircraft into the night sky and, looking down he can distinguish in the darkness below, the town of Sainte-Mère-Eglise. The air around is filled with parachutes and C47 s, the sound of their engines combines with the explosions of artillery fire.